Connected Health » Health Gadgets » Will implantable health gadgets be big in 2013? We’ve all become accustomed to health gadgets that hook onto our belt loops, sit in our pockets or strap onto our arms, but could gadgets that are implanted into our bodies be the next big health tech trend of 2013? A US-based company called IntraPace has been developing a gadget that can be implanted into user’s digestive systems in order to stop them feeling hungry. The gadget is implanted using laparoscopic surgery, meaning it’s a serious measure but not as invasive as many other kinds of surgery. While it’s implanted the abiliti can send data to an online dashboard, allowing users to track their food consumption and share the information with friends, family or medical professionals who are keeping a close eye on the weight loss process. 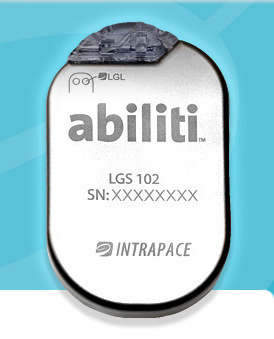 The abiliti device is obviously quite a drastic measure for those who have exhausted other weight loss options, but it’s ability to suppress hunger and keep constant track of everything that’s happening inside a user’s stomach means that it’s a good alternative to serious gastric band surgery.